NEOX Softswitch is a cost-effective VoIP solution that enables carriers and service providers to offer a VoIP platform supporting secure and reliable Class-5 features and functionalities over a packet-based network. The solution offers carriers and service providers the ability to launch competitive new service offerings quickly and easily to increase subscriber stickiness and revenue generation. The solution is well designed to be geographically distributed, to cater the carrier's requirements. The NEOX Softswitch permits centralized control of geographically distributed components, facilitating the carrier with immense operational ease. The NEOX Softswitch provides NAT Traversal feature, which facilitates transmission of media traffic between edge devices that reside in private IP networks. The solution supports N+1 redundancy, allowing carriers to ensure that services are not interrupted in case of machine / hardware / other failure. Lawful Interception (LI) is the legally sanctioned access to private communications by authorized agencies. This solution provides LI using a partner component. The NEOX Softswitch facilitates effortless configuration and maintenance through its web-based interface. A powerful but user friendly interface, facilitating a secure user authentication and authorization, allows customers to self provision services as per the individual requirement. 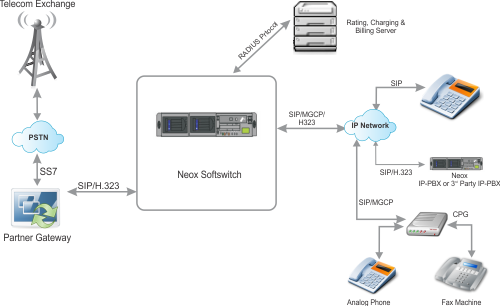 NEOX Softswitch supports SNMP with a comprehensive management information base (MIB). You can set configuration parameters, poll devices for performance statistics, check status information, and receive alarms, if faults occur. The Least Cost Routing feature causes the solution to always use the call route with the lowest cost rating within a priority level. Rating feature allows service providers to provide flexible rating & charging with features like base rate, drop-off rates, based on time of day, special day rates, etc. NEOX Softswitch runs on a reliable Linux Operating System, which increases security, provides ease of administration to Linux savvy administrators and reduces the overall solution cost. Interactive Voice Response Platform has been provided which detects touch tones. This IVR system can respond with a pre-recorded audio to enable automatic call answering. This can provide various features like Two Stage Calling, Advertisements, MusicOnHold, etc. This solution supports RFC based standard implementation to integrate with leading Conference /Media / Voice Mail servers, enabling carriers to provide VAS services. The solution provides RADIUS Interface to OSS/BSS vendors, enabling the carriers to authenticate, authorize and do accounting using the secure RADIUS interface. 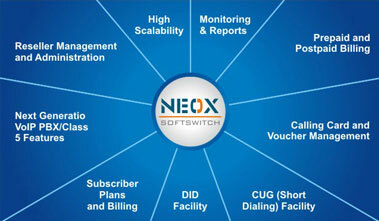 The NEOX Softswitch seamlessly integrates with 24Online to provide Convergent Billing Solution. 24Online offers complete Wired and Wireless (Wi-Fi) based Hospitality Internet Access management solution to ISPs and chain of hotels. NEOX Softswitch offers a secure and flexible prepaid service recharge solution through IVR. Centrex framework allows service providers to deliver PBX features to an enterprise without the associated expenditure maintaining and managing costs of a premises-based telephony system. Compliant with Regulatory Emergency Services (E911) requirement. Supports the Location Routing Number (LRN) method for number portability. Supports Lawful Interception (LI) to provide legally sanctioned access to private communications by authorized agencies.